When author Lauren Kessler’s teenage daughter, Lizzie, and she start to have problems due to Lizzie’s new-found adolescence, Lauren takes action. Instead of continuing to bicker and further destroy their relationship, Lauren immerses herself in Lizzie’s life. And we aren’t just talking about being a spectator. 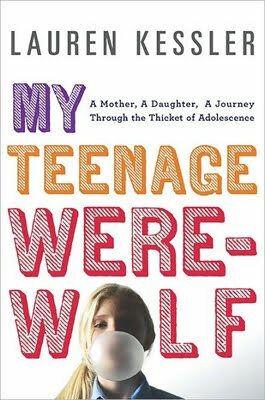 In My Teenage Werewolf: A Mother, A Daughter, A Journey Through the Thicket of Adolescence, for 18 months Lauren heroically (and patiently) sits in on Lizzie’s classes, attends her wrestling and track practices, follows her to summer camp and more. What she learns about Lizzie is invaluable and changes their relationship dynamic forever. Kessler is the amazing author of several non-fiction narrative books, including Clever Girl and The Happy Bottom Riding Club. She is witty, clever, and turns non-fiction into a fun, enticing world. As a mother, I was thoroughly impressed with Kessler’s want and will to understand her daughter, instead of just “dealing” with her. I do not have a daughter, but for anyone that is raising a young woman, this is an excellent read. Even being the mother of boys, I can appreciate what Kessler did to gain an understanding of her “little girl”. I even noticed some parallels to Lizzie’s behavior and behaviors from my own adolescence. My Teenage Werewolf retails for $25.95 in hardcover and can be found on Amazon.com and at other major local and online bookstores. Thank you to Viking for sending us a sample copy of this book free of charge to base this review upon.